Its a CPD day like no other . . . for starters, its held in a post-mortem laboratory and is always so popular that every available seat and stainless steel bench is occupied with vets; the talks are delivered by four vets currently practising in Northern Ireland and the best presentation is traditionally chosen by the President of the Royal College of Veterinary Surgeons. This year we welcome Dr Bradley Viner along to perform this difficult task and to present the beautiful Frank Mullan trophy to the winner. Topics will include bovine liver biopsies, common types of lameness in racehorses, the advantages of myostatin testing and practical applications for MRI in small animal practice. The talks are followed by the AVSPNI AGM (members only) and a three course dinner at the Silver Birch Hotel. For full details please see the flyer and don’t forget to REGISTER by close of play on Monday 4th January if you plan to attend. Demand is expected to be so high that we will once again relay proceedings through to the staff-room at AFBI where there will be over-spill accommodation – once that is full we may have to turn away any unregistered delegates. Here are a few pictures from last year’s event (January 2015) showing winner Carolyn Perkins receiving her trophy from RCVS President Stuart Reid, the handover of the AVSPNI Presidency from Alan Gordon to Melanie Spahn, vets listening to the presentations and our four speakers. Omagh733 The new President of AVSPNI Melanie Spahn is congratulated by Alan Gordon outgoing President. 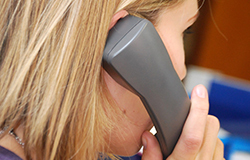 The RCVS received a number of reports from vets/vet nurses on 3rd December about suspicious telephone calls made to vet practices in different areas of the country. In each case, the caller has given a forename, eg Felicity or Christine, claimed to be calling from the RCVS and asked for bank or payment card details in order to refund an over-payment of £235.75 made in June 2014. Please note that RCVS would never ask for payment card or bank details, take payments or make refunds over the phone. If you have received a similar phone call, or are concerned that you might have inadvertently passed on private financial information, please contact your local police. The RCVS has emailed this information to all UK-based veterinary surgeons and veterinary nurses. Check RCVS website for any updates. In partnership with MSD and Volac, AVSPNI invites its younger members to attend a heifer rearing workshop – “Feed for Growth” – at Greenmount College on 8th December. This all day event will include talks by, amongst others, Mike van Amburgh of Cornell University, Jamie Robertson of Livestock Management Systems Ltd. and Steven Morrison, programme leader of Sustainable Livestock Production at AFBI. The technical content of the day makes it especially suitable for young vets and the more progressive young farmer so, practice principals, why not send along your youngest team member(s) and ask them to extend a personal invitation to forward-thinking young farming clients too? For full details of this excellent day, see the flyer. New guidance has been published by RCVS. You can access it here. Sheena Warman is eminently well qualified to deliver a talk on “Bleeding Disorders” for AVSPNI. She is a Senior Clinical Fellow in Small Animal Medicine at the University of Bristol in the UK and spent 4 years in mixed practice before undertaking a residency in Small Animal Medicine and Intensive Care at the University of Bristol. She gained RCVS and ECVIM Diplomas in Small Animal Medicine in 2004 and will deliver a lecture to NI vets and nurses at VSSCo on 3rd December which will incorporate a brief review of the pathophysiology and causes of bleeding disorders in dogs and cats and case-based discussion of the diagnosis and management of such cases. The evening is open to vets and nurses (nurses places are limited so register early!) Full details are on the flyer. E-mail info@vetni.co.uk to secure your place. Please see most recent post on this topic . . . this one has been superseded by NEW ADVICE from VMD. We have been asked by VMD to remind you all that the rescheduling of ketamine to Schedule 2 takes effect from 30 November 2015. In due course, information should appear on the DHSSP (www.dhsspsni.gov.uk) website regarding this, at which point, please make your own investigations at to see exactly how changes will affect you. My (layman’s) understanding is that in a nutshell, each bottle needs its own register (a bound book); stock must be locked in a non-portable container and of course there are strict guidelines re. disposal of product and syringe wastage. This is applicable to each and every bottle so if you keep stocks in your vehicle, please ensure that you comply, especially re. non-portable container. We have been promised a FAQ sheet from VMD on this subject and will make this available via this website as soon as we have it. The Royal College of Veterinary Surgeons (RCVS) launched the new Practice Standards Scheme (PSS) on 20 November 2015 to the veterinary and veterinary nursing professions. It is now open for applications for both practice accreditations and the brand new system of PSS awards. The new Scheme is all about offering a pathway to improvement for practices of all shapes and sizes that want to aspire to excellence, and then highlighting these achievements to the animal-owning public in a way that is clear and easy to understand. Over half of all veterinary practice premises in the UK are already RCVS-accredited. The main changes to the Scheme, which was established in 2005, have been based on feedback from the profession and input from the Practice Standards Group (PSG), with the dual aims of making it more accessible for those practices which aren’t yet PSS members, and even more rewarding for those who are already accredited. Whilst retaining the existing accreditation levels across small animal, equine and farm animal practices (current RCVS-accredited practices will be automatically transferred to the new Scheme), a new modular structure helps to make the Scheme more flexible and ensure all types of veterinary practice – from ambulatory services to veterinary hospitals – can join. This structure also recognises the contributions of the whole practice team, helping to raise standards across the board. Once accredited, practices can now apply for a range of optional awards that focus on outcomes and behaviours in specific areas, such as ‘In-patient Service’, ‘Team and Professional Responsibility’ and ‘Client Service’. As an introductory offer, the RCVS is now inviting applications from practices that would be willing to help with a final round of testing of the new Scheme, to be in with a chance to win one of 20 free assessment days, worth £350. The offer is open from 20 November until Friday 4 December, and the first 20 practices drawn at random on 7 December will be allocated the free assessments. Leading health organisations call for proper use of antibiotics. Leading human and animal health organisations – the British Medical Association (BMA), British Dental Association (BDA), British Veterinary Association (BVA) and Royal Pharmaceutical Society (RPS) – join forces for the first time to promote a ‘One Health’ approach to ensure responsible guardianship of antibiotics and their proper public use this European Antibiotics Awareness Day (EAAD, 18 November 2015). Antibiotics are a vital medicine for both animal and human health, and modern health systems rely on the availability and effectiveness of a range of antimicrobials to treat and prevent infections. Yet inappropriate use – such as prescribing for self-limiting infections, not finishing a prescribed course of antibiotics or habitual prophylactic use in healthy animals to prevent disease – all contribute to the development of resistant bacteria in both humans and animals. The effectiveness of antibiotics has led to greater pressure from patients to be prescribed antibiotics as a panacea for all cases. According to a recent BVA survey, three out of five vets see clients who expect antibiotics to treat their pets. Yet despite the expectation to prescribe, there is still a lack of understanding about responsible antibiotic use with 70% of vets reporting poor owner compliance and a recent study showing nearly 6% of households with leftover antibiotics prescribed for humans, meaning patients had stopped their treatment early. To mark EAAD 2015, BVA has produced a range of new posters to promote the responsible use of antibiotics for use in veterinary practices or as a source of information for pet owners which can be found on their website www.bva.co.uk/eaad. Below is a link from SPVS for the salary survey. This is a survey for all practice employees and partners if they wish anybody who replies will get a full set of results back. The finished results give a break down of salaries paid to vets , nurses , receptionists and practice managers broken down in a number of ways , region / years qualified / type of work they are doing etc. It also has a section on extras i.e. cpd allowances pension and etc. The results are of great insight to both employers and employees looking to hire or be hired!! Of course the means , averages and median values take on more significance the more people that reply from each region. It only takes 4 to 5 minutes. Ever considered using your veterinary skills abroad? Thinking of working abroad? The World Veterinary Service has helped many vets do just that and Managing Director James Florence is coming over to Northern Ireland to tell us more about the work of WVS. The NIVA Winter meeting, which is always highly social and includes seasonal refreshments, canapés and mince pies will be held on 2nd December at the Ramada, Shaw’s Bridge. For more details, see the flyer. Our thanks go to MSD for their generous support of this event. We look forward to seeing lots of you at the Ramada!